a snapshot in time. 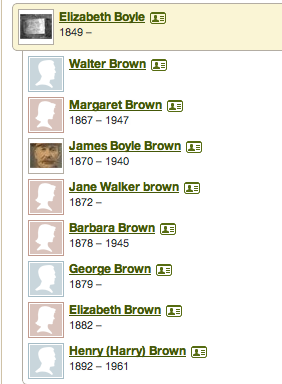 We share the same fourth great grandparents, James Boyle and Margaret Walker. Betsey McLauchlin was from Dromore, Tyrone, Northern Ireland. In the year 1831 there were only 500 residents in the small town. 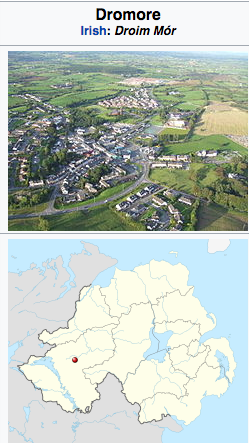 In 1838 Dromore, in the Parish and Barony of Omagh, was described as a poor town in hilly and bleak country which stretched far around, yet the arable lands were for the most part good. The population of the town was 480 in 1831, and 551 in 1841. The town was originally built in 1757 when the then Lord of the manor, William Hamilton, of Aughlish House gave a grant of the townland of Mullinacross, now called Dromore, to two families – Stewart and Humphreys. The town at that time consisted of only four houses. The original name of the townland is derived from an ancient stone cross which formerly stood on the top of the hill overlooking the town, and near to where the CistercianAbbey was located. This abbey which was destroyed by a fire in 1690 is said to have been built on the site of a nunnery founded by Saint Patrick for Saint Cettumbria, the first Irish female who received the veil from his hands. In the village, still to be seen, are the ivy-clad remains of a Protestant church built in 1694. Luke Boyle and Betsey McLachlin were married in Paisley, Renfrewshire, on 3rd December 1820. They had a Roman Catholic Ceremony. 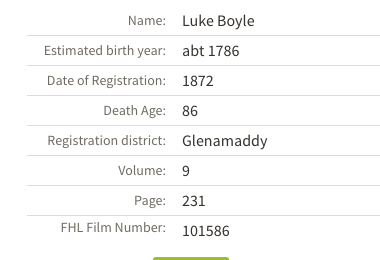 Luke did return to Ireland and we find his death in the year 1876. The Boyle/Walker line had eight children and as history tells us their children spread to various parts of the globe for various reasons. Not only Scotland, but Europe was also in turmoil at this time in history. The towns and villages of Scotland were changing forever and many Scots were heading to the New World to try and make a better life for themselves and their descendants. 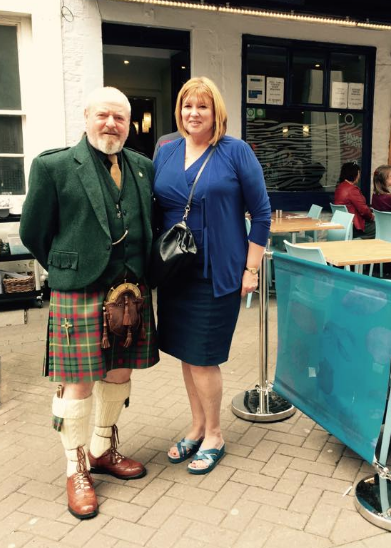 The Boyle family, originally from Ireland, had settled in Lanarkshire in the early 1800s. Elizabeth Boyle, however, who was born in 1849 had other ideas. 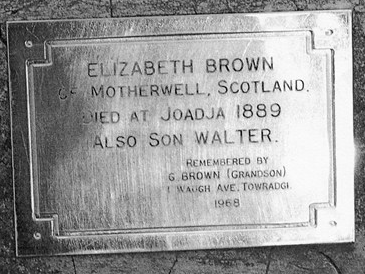 She married Henry Brown in Lanark on 15th March 1867. 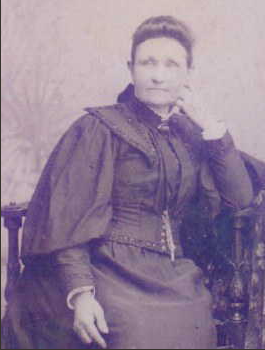 Elisabeth Boyle – one of the Boyle siblings to emigrate to Australia. Henry’s parents were William Brown and his mum was Margaret, maiden surname unknown. 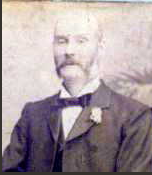 The Brown family can be traced back another couple of generations to Henry born c 1790 in Lanark. By 1861 the Brown family had moved on and now residing in a coal mining community in Hamilton Road, Bothwell, in Lanarkshire. The census tells us that William and his three of his sons, Walter, age 12, George age 14 and Henry age 16 were all employed as coal miners in the colliery. 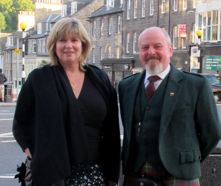 Such a harsh life for all that us living today cannot envisage.http://scottishmining.co.uk/142.html. William was still mining in 1881 and now at 17 Springbank Row in Shotts in Lanark. His wife Margaret was also with him, but the children had all moved on. Karen’s line was Barbara Brown. Barbara was born on 14th January 1876 in Dykehead in Shotts in Lanarkshire. She emigrated with her family to Australia when she was just 4 years old. 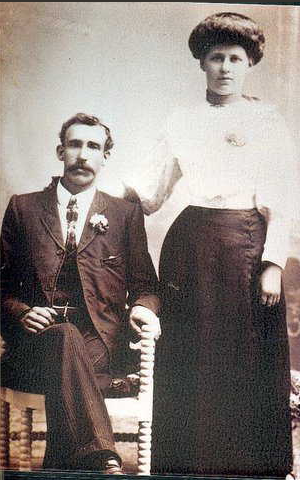 It was on 18th November 1893 that she married Thomas Evans in the town of Katoomba in New South Wales in Australia. They had a son Thomas born 1894, who took on the name of Dobbie after their marriage split up. For whatever reason, unknown to us today Barbara’s marriage failed and she then met the love of her life, Karen’s great-grandfather, James W. Dobbie and they had another three children Jessie 1898, Doris, 1904 and Walter Henry 1908. Walter Henry born 1908-1978 was our Karen’s grandfather. He married Mary Molly Frances May Talbot 1910-2004. 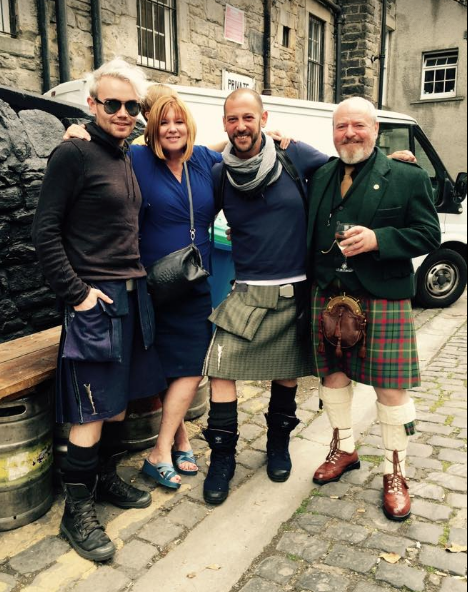 Their son John William Dobbie was born on 2nd April 1933. The Brown\Boyle family left for Australia and arrived in New South Wales where their children would have a chance hopefully that their descendants would find work in other industries and perhaps their lives would not be as harsh as in Scotland with the cold damp weather and very poor living conditions which the working classes had to endure at this time. For this particular branch of the family this was indeed the case. We now know Elise and she has worked very hard and is self employed in the teaching industry. She resides in Hong Kong and enjoys her hobby, genealogy, with a great passion. Hello John and thanks for your three comments, I suppose then that we will also be third cousins. I take the opportunity to welcome you into the family and would love to include you line in the website. I will e.mail you directly.